When people think of steep streets in L.A. the first ones that probably come to mind are Fargo and Baxter St. in the Echo Park / Silver Lake area. Fargo was covered by local legend Huell Howser who did a piece on the L.A. Wheelmen’s annual bike climb. Baxter had it’s own feature in L.A. Magazine. But the reality is another shorter, lessor known street holds the title as L.A. steepest. Eldred St., which is resides on the northeastern edge of the Mt. Washington neighborhood, is the steepest street we’ve got in our fair city. And because you probably didn’t know that, listed below are 5 other quick things about one of L.A. most notable streets you may never have heard of. 1. With an incredible grade of 33%, Eldred St. in Highland Park is L.A.’s steepest drivable street. Although San Pedro’s West 28th St has a stretch with a grade of 33.3%, it only goes for about 50ft. or so and therefore many feel does not make the cut as a drivable street. Baxter and Fargo, both mentioned above, have sections with grades in the 32% range. 2. Eldred was constructed in 1912, several decades before the city mandated that no streets have a grade steeper than 15%. 3. 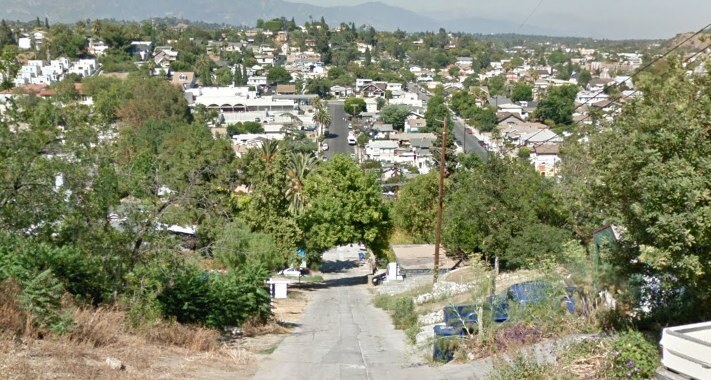 Sources, including the L.A. Times and research done by Fixr.com, state that Eldred is the not only the steepest street in California, it’s also the 3rd steepest in the United States. 4. Although most people probably think of San Francisco has having the steepness edge when it comes to street, Eldred has a grade that is 1.5% higher than the grades on two of San Francisco’s most notoriously steep streets, 22nd St. and Filbert. 5. Because of the ridiculous grade, the city has special miniature sized garbage trucks (regular size trucks would tip over due to that pesky thing called gravity!). There is also a special group post office box at the base of the street so postal workers are not required to go up the steep hill. If your interest is piqued by any of the above information, be sure to check out the Tom Explores L.A. episode embedded below with some additional information about Eldred St. There is also a reference map embedded at the bottom if you’d like to check out the street for yourself. And, as always, enjoy the city!